Labradoodle Shedding, do labradoodles shed? Labradoodles Shedding, the non shedding dog? Do Labradoodles Shed? Do Labradoodles Shed, the non shedding dog. Do labradoodles shed? Do not believe that all labradoodles or Australian Labradoodles are non shed dogs, some shed and some do not. This result all depends on the parents, basically the answer depends on genetics. In addition, I need to define shedding, all dogs lose hair. Some have a fur coat and lose fur individually all day, more prior to hot weather. Fur grows to a set length then drops out then grows again to a set length and falls out, this is shedding. Some breeds have long fur and some short, this refers to the length it grows before falling out. Other dogs have a hair (like human hair) coat, like poodles, and will occasionally scratch or pull out small clumps of hair leaving a dust bunny around the house about once or twice a week. These dogs will need grooming or their coat will grow and grow very long. These dogs are considered non-shedding, more information is on the Labradoodle Coat section of our website. 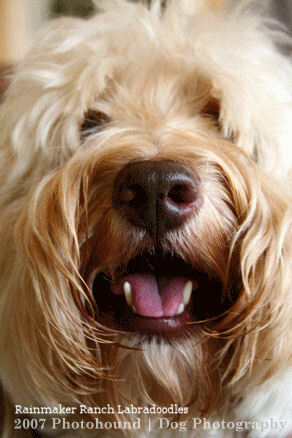 For details on what allergy friendly indicates please read our Labradoodles and Shedding section of this website. If your family wants a non shed dog, specifically you want at least a third generation or later Labradoodle OR Australian Labradoodle. Either can have a Fleece or Wool Coat. Australian Labradoodle? If your family wants a non shed dog, allergy friendly pet* an Australian Labradoodle with a fleece or wool coat is one of the BEST choices. If both parents of an Australian Labradoodle puppy do not shed your puppy should not. Selective breeding for the coat trait should result in a non shedding coat. It takes at least three generations to consistently produce non shedding results and even then a breeder can occasionally produce a slightly shedding dog due to recessive genetics. Currently we only breed Australian Multigenerational Labradoodles first (a first generation Australian is 2 generations past an F1) to 4th generation because we feel this produces the most consistent offspring to our standards. We only breed fleece coat, non shedding and allergy friendly. The parents, grandparents and even great grand parents to your puppy are as non shed and allergy friendly as a dog can be. Labradoodle Third Generation or higher (Second Generation: F1B to Second Generation: F1B or Poodle...)? If your family wants a non shed dog, allergy friendly pet* both parents need to also be allergy friendly and non shedding, AND both sets of grandparents as well, for this to be the BEST choice. If you are looking at a third or fourth generation Labradoodle, and both parents and grandparents of a Labradoodle puppy do not shed your puppy should not. Selective breeding for the coat trait should result in a non shedding coat. It takes at least three generations to consistently produce non shedding results and even then breeder can occasionally find a slightly shedding dog due to recessive genetics. Labradoodle Second Generation (F1B), First Generation Labradoodle bred to Poodle? If your family wants a non shed dog a Second Generation Labradoodle of about 75% poodle with a fleece or wool coat is a better choice than a F1 but no sure bet. Make sure you are not purchasing a dog that is sometimes called a Second Generation (a first generation bred to a first generation). Remember, the odds that a F1B will not shed or be allergy friendly* is still only about 50% depending on the first generation Labradoodle and the Poodle coats. Some are super curly like a poodle and some are as flat coated and shed as much as a Labrador. This is due to short coat being a dominant gene. Labradoodle First Generation (Lab bred to Poodle)? Within the Labradoodle First Generation population there are primarily two different coat textures, flat coated which has a wiry feel and fleece coated with a harsh feel. Studies are being conducted to identify if this texture in the coat is an indication of adult coat shedding and/or a predictor of causing an increase in allergies for humans. There does not seem to be a connection between Labradoodle First Generation coat wave and shedding, so identifying which puppy will and will not shed as an adult is an educated guess at best for breeders. Usually a dog will shed its coat once it reaches a length predetermined by genetics. This is the reason we have long coated but still shedding dogs and short coat shedding dogs. Genetics predetermine what length the coat will grow and then shed. 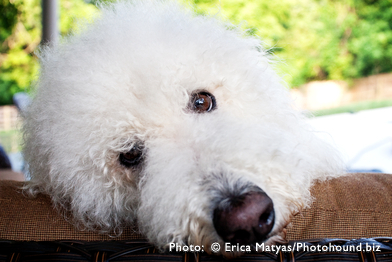 Poodles are considered non shedding as their coat will grow to the floor and still not fall out seasonally. For another example, a Puli is considered a non shedding dog as its coat is dread locked, grows to the floor then clipped. 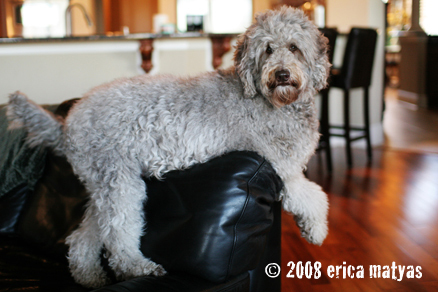 First Generation Labradoodles are wonderful dogs but NOT a good choice for the family that does NOT want a shedding dog. Many, at least 75% of, first generation Labradoodles do shed and most increase allergy symptoms to some degree, some more than others. 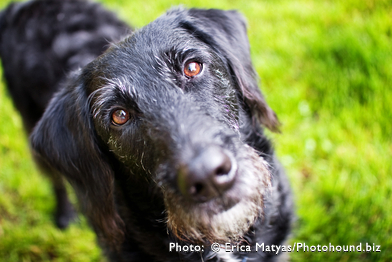 We would never recommend a F1 Labradoodle for a family needing a non shedding dog or with allergies to dogs. However, if you have a shedding labradoodle your best bet is to keep the dogs coat shaved short and feeding them the best of foods to reduce shedding as much as possible. *Please read about non shedding and allergy friendly by clicking at the FAQ link to the left. Do labradoodles shed?